On Saturday, the Buckeyes will look to make history, becoming just the 10th team in OSU football lore to go undefeated and only the sixth to go undefeated and untied. 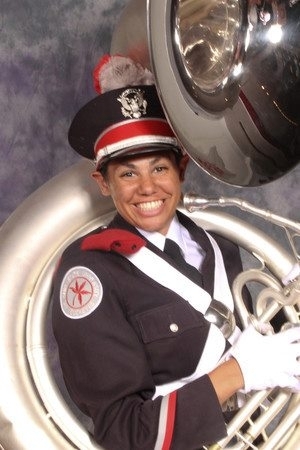 At halftime, another historic moment will occur as Jocelyn Smallwood, a senior sousaphone player from Upper Arlington, will become the first African-American woman in the history of TBDBITL to dot the i and the first woman ever to dot the i against Michigan. Recently, I had a chance to sit and chat with Jocelyn to discuss her upcoming historical moment and I was blown away by her deep appreciation for Ohio State, the band itself, and the honor of being able to make history. How long have you been playing instruments and how did you end up deciding on the sousaphone long term? I think I’ve always been musically inclined as I’ve always enjoyed listening to music and being around it. When I was really little I had this cassette player I’d keep by my bed and I can remember lying in bed at night and playing the Finale of the 1812 Overture over and over until I fell asleep. So I’ve always loved music. But I didn’t start playing instruments until I was in the fifth grade. That’s when band starts in my school system. I started out on the trumpet and played it from the 5th grade to the 8th grade, when I became bored with it. I think mostly I was just being angst ridden or something, but I told my band director I was quitting and he informed me that wasn’t going to happen, so I switched to the tuba. From that point on I couldn’t get enough of music and band. 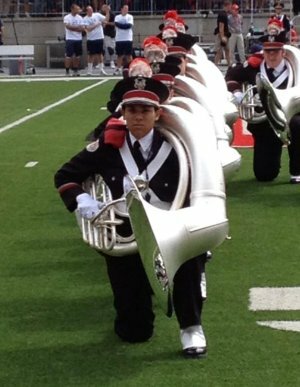 I started playing the sousaphone (marching tuba) my freshmen year of high school. 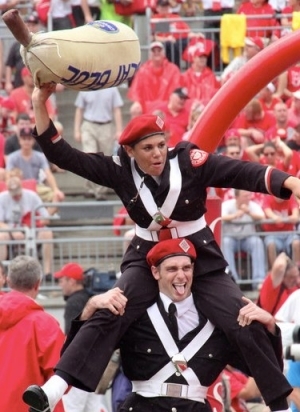 How long have you been in the OSUMB and how did you land at Ohio State? A lot of kids from my high school come to Ohio State. But I was convinced that if I came to school here I would end up being just like everyone else and that’s something I’ve always wanted to avoid. But, mostly because of financial reasons I started considering Ohio State more seriously in the spring of my senior year. During that time I happened to have a conversation with my high school band director in which he told me he thought I should try out for TBDBITL because he thought I could make it. I’ve always looked up to him and taken his opinion very seriously, so I went to the recruitment night the band holds every year and was sold. The day I told my parents I had decided to come to OSU we had one of those conversations where they told me, “Take your time, you don’t have to decide right now” but I was done deciding. I just told them, “I’m going to Ohio State. I’ve made up my mind. Now I'm going to start working on making this band." What’s your major and what do you want to do after college from a career standpoint? I'm majoring in International Studies with a focus on security and intelligence. It’s basically a combination of political science and international issues. I’ve chosen to focus a great deal on terrorism and counterterrorism. I’m debating right now whether I want to go to graduate school or join the military. My end goal is to at some point work for the federal government. Do you come from a family with a strong Buckeye background? Absolutely. Living as close as I did to campus growing up, you’re a Buckeye regardless of whether or not you have an actual connection to the university. However, both of my parents attended undergrad and law school at Ohio State. One of grandfathers was a professor here and another attended for undergrad, so our familial connection is very strong. What are the demands during the season as a member of the OSUMB? It’s stressful. I would honestly compare it to playing a sport as far as time goes, or at least having a job. We’re only required to be there from 4:10-6:10 each day, and then five and a half or six hours before kickoff on a game day. But, I’d say most people spend upwards of 20-25 hours a week doing band, including game day. I normally get to the band center around 3 and leave around 7. But that’s on a normal day. During a one-week show I’ll spend from 2 in the afternoon to 10 or 11 at night at the stadium rehearsing and then memorizing music and working on things. That’s not abnormal at all. So it’s hard—you have a lot to do and during a season like this where we have 4 or 5 straight weeks of home games which means 4 or 5 new shows back to back, that’s rough. Very little sleep and lots of stress. But I love it—I wouldn’t trade those late nights of memorizing music and Friday nights where I go to bed at 1 AM and get up again at 4 for anything. What’s the selection process for determining who dots the i and how far in advance did you know you’d get to do it against Michigan? It’s oddly complicated. Who dots the i at what game is determined by rank. Every row in the band has 14 people, but only 12 of them march every week. The other two are called “alternates.” They’re like substitutes on a sports team. Alternates are absolutely part of the band and row and who is an alternate changes throughout the season. Their job is to help with some of the props on the field for shows and things like that, but most importantly they participate in challenges on Monday afternoon. Challenges are a 20-minute repeat of tryouts in which an alternate picks one of the 12 “regulars” to compete against for the spot. They generally pick someone they think they can beat. The challenge system is meant to keep everyone on their toes at all times. Anyone can be challenged, even fourth and fifth-year members. In fact, late in the season many alternates will pick out a fourth or fifth-year member who has stopped practicing and become complacent and challenge them. Often the alternate will win. So, the squad leaders judge who marches better and pick someone to win and march the regular spot for that week. Rank is based on how many performances you march. They’re known as “ramps” and “performances.” Every time you march down the ramp in Ohio Stadium, that gives you higher rank. So, you count the number of ramps someone has and you go in order from highest to lowest. Other performances, like away games or a bowl game count as tie breakers. So, if two people have 15 ramps but one performed at the Rose Bowl our first year and one did not, that person who performed would be ranked ahead. Once you get to the end of your third year in band, you have a night during the spring where you pick what games you want. You pull up the schedule and go through it from the top-ranked person to the lowest. It’s an amazing night—everyone is so excited and everyone picks their games and then we have a party. I’ll remember it forever; it was amazing. So anyway, I’ve been challenged five times I think, which is actually a fairly low amount, and was fortunate enough to win all of them. Having never been an alternate, I’m ranked first. So on that night I got first pick of the games and picked Michigan, just because traditionally that’s the one people want. So technically I knew I was going to dot against Michigan last spring. But I’ve been trying not to screw up anything since halfway through my freshman year because I knew if I was able to keep that spot I’d be able to dot against Michigan. Somehow that happened. I worry a lot that I’m going to wake up and it will all have been a dream and I’ll be back in my rookie year or something. But we’re getting pretty close so I’m starting to believe I’m actually going to get to do it. What’s dotting the i mean to you? How much sweeter is it knowing you’re the first woman to do so against Michigan? People ask me all the time and I haven’t been able to come up with anything that accurately describes it. I don’t think words can describe it accurately enough. Being a part of that tradition is unbelievable, especially since I’ve wanted to do this game in particular for so long. The day I found out that Michigan was at home my senior year I was still practicing for tryouts. A guy who I now know well because we were in band together for two years was helping me practice and mentioned that Michigan was a home game in what would be my senior year. I hadn’t even made the band yet and I decided on the field that I was going to dot the i against Michigan. It happened quickly and I immediately told myself, “No, you can’t think about that. You haven’t even made the band yet. You have to do that first” but it wasn’t much use. I’m pretty stubborn. So, from then on, it was full steam ahead towards that goal. But actually achieving it after having a moment like that is pretty crazy, being able to look back at that and know in a few weeks I’m doing that is indescribable. There were plenty of hurdles on the way to this point, but somehow I managed to get here. And that’s what I think it’s really about for me. This is special because of all the people who are going to be with me on that day. It’s a physical manifestation of the time and effort that many people have put into me. I’m excited to have an opportunity to thank them so visibly for everything that they’ve given me because I wouldn’t be here without them. Being the first black woman is special. I don’t ever mean to downplay that. But, that’s so far from the front of my mind when I think about it. When I decided I was going to try and dot the i against Michigan, I didn’t think at all about whether any women or black women had done it before. I just wanted to do it. It was special enough in and of itself that I didn’t even think of the “firsts” other people are discussing. Someone had to tell me “Hey! You’re going to be the first female i dotter against Michigan and the first black woman to dot the i ever!” And that was three or so years ago when I was really far away from dotting the i against Michigan and I smiled and thought, “That would be cool” and then got back to work. However, I think the more important thing it brings out is that the band doesn’t see those things. I’ve heard people say, “Why has it taken so long for this to happen?” or things like that. And honestly one of the things I love about this band is that when you try out the only thing that matters is skill. They don’t care about gender, race, religion, sexuality, political persuasion, socioeconomic status, or anything. They care about how well you march and play. And if you can meet those requirements they pick you. They don’t care about the rest. I was listening to a woman speak who was running for Congress at one point. Her name is Joyce Beatty. And when she was asked about how it felt to be someone who is seen as breaking through a lot of barriers for African-American women, she responded that being a first doesn’t mean much if there isn’t a second. I don’t think I’ve ever heard anybody say it better—I think it’s great that I’m recognized for doing this. And I appreciate the positive attention. But mostly I hope that it signals to people that it is not an anomaly for a woman or a black woman in particular to be successful in this band, or anywhere for that matter. Maybe some young woman, regardless of her race, will see this and think, “I can do that.” If that happens, it would be great. But as far as day to day thoughts about November 24, I don’t think about it. I’m just happy to have the opportunity to dot the i at all, let alone at that game. No more questions but since thousands of eyeballs will read this interview, is there anything else you want to say to Buckeye Nation leading up to The Game? I just want to thank everyone who has ever helped me. Family, friends, teachers, coaches, and the staff and members of TBDBITL. I wouldn’t be doing any of this without those people and more than a celebration of what I’m doing, I think November 24th is really an opportunity to celebrate them and the wonderful support everyone has given me. I love this band and university more than I can describe. For more insight from Joceyln, hop on over the Blog Post section for Dotting History, Continued.